Midnight showing of "Where the Wild Things Are" = awesome. Too bad Burger King didn't see that one coming. So many kids in white fur jumpsuits and BK crowns, making it my number one prediction for the most popular Halloween costume. That and Michael Jackson, of course. 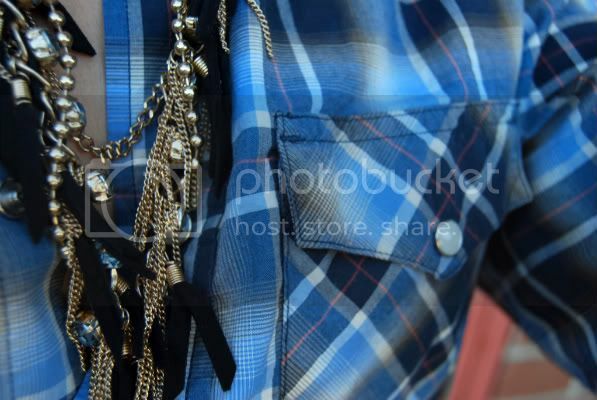 Love the plaid shirt and that necklace! And I LOVE your comment about BK crowns and Where the Wild Things Are. Nice. I was a wolf for halloween way back when I was like 12 and now I really want to bring out that costume and wear it to the theater to see WTWTA. NERD ALERT. Haha. so so cute! i love the western shirts. And I love the the skirt! i am so excited to see that movie, i can hardly wait! i love the socks with sandals - keeps your toes warm in fall! don't foget Lady Gaga....every girl/ guy who wants to be in drag will be doing Gaga, something about wearing as little as possible out for Halloween makes sense with that costume...no? Love your skirt and necklace!! so fashion! kisses from mexico! I love your outfit. It's laid back yet so chic! I love how you paired your amazing heels with socks! I am loving your socks and open toe heels! Adorable!